Hey dolls, hope you all are doing great? Well here is wishing all my blog viewers a very happy new year. May 2016 be more prosperous and bring loads of happiness for all you lovely people out there. 2015 was overall a good year for me with little ups and downs but the best part was my blog which I had started last year itself! So before I become more nostalgic, let’s head over to today’s blog post. So ladies, I am back with another review today. Today’s review is about some amazing hair care products from a very well known brand, namely, Forest Essentials! 🎑💐 So the other day I had received two sealed packs of Mashobra Honey & Vanilla hair cleanser and a hair conditioner from Forest Essentials. 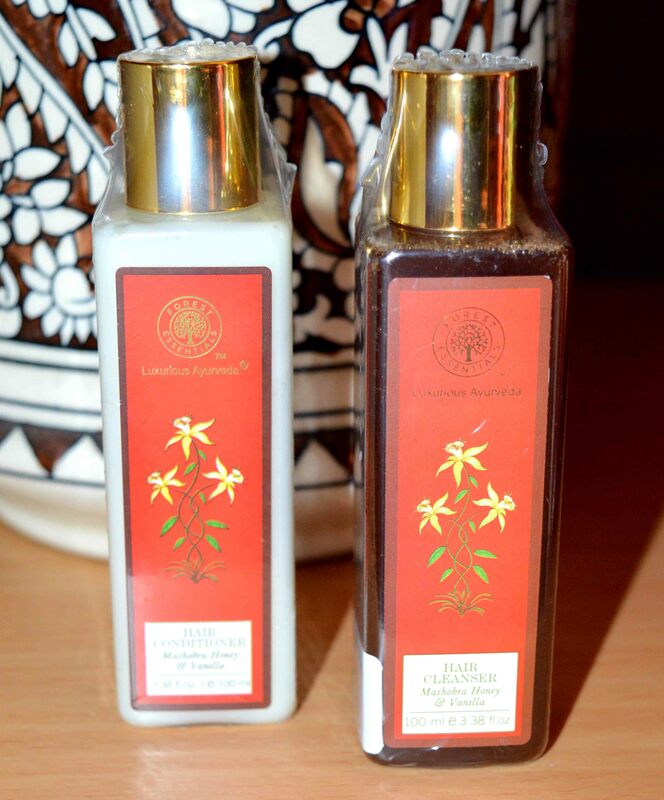 Forest Essentials is a well known traditional Authentic Ayurvedic brand which has skin care and hair care products made from nature and natural ingredients! 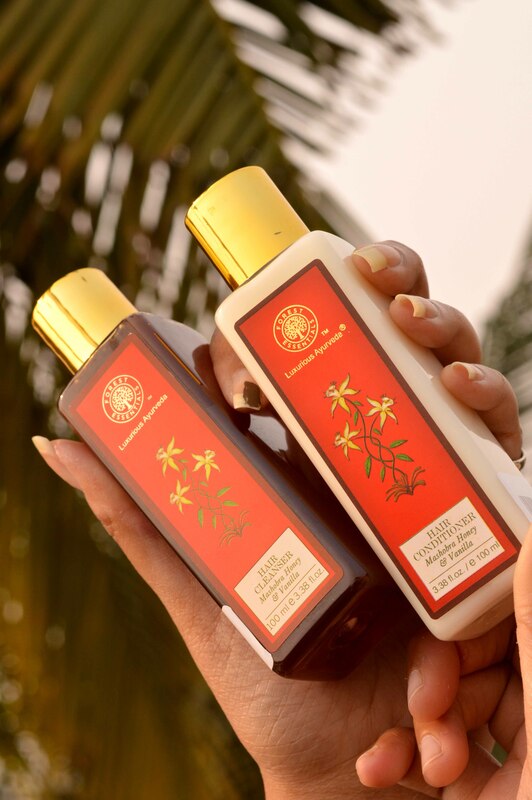 Having Key ingredients like Aqua, Virgin Coconut oil, Amla fruit extract, Henna leaf extract and many other nutritious natural products, the hair cleanser cleans the scalp effectively and smoothens the hair as well, giving the hair proper volume and the natural shine. With a very sweet essence of honey & vanilla, it feels absolutely heavenly after the application of this cleanser. We should always keep in mind that a shampoo from any brand is incomplete without its’s corresponding conditioner. I have been using this amazing cleanser and conditioner from Forest Essentials and I have absolutely loved the feel of my hair after the use. But since these are natural products with no chemicals involved, it can some times be allergic to some people, so it’s always advisable to do a test patch on the elbow and leave it for thirty minutes. It should be discontinued if irritation occurs. 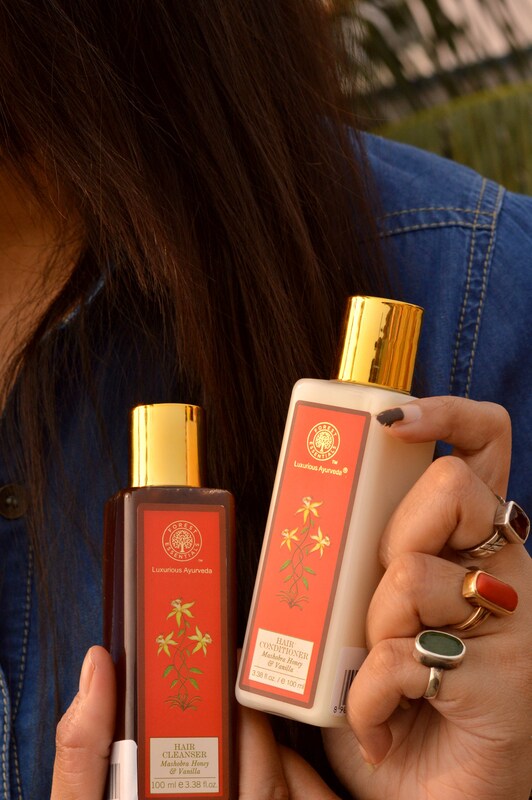 ☺ Here are some exclusive clicks of the hair care products! Enjoy!! So that’s all for today. Hope you all enjoyed the review for the day. Don’t forget to like and comment and lemme know your views . All your views and suggestions means a lot to my blog. Next Post Paper Boat – Drinks & Memories!